So, I finally got around to watching The Hobbit – An Unexpected Journey tonight. Unsurprisingly, the scene I loved most was seeing the Eagles of the North. All I could think about as I watched them soaring across my TV screen was how much I’d love to see the rigs and learn how to create something that could be animated so beautifully. Plus, those feathers… just wow. I can only assume there was dynamics on them, and I’d be fascinated to know how that was done too. 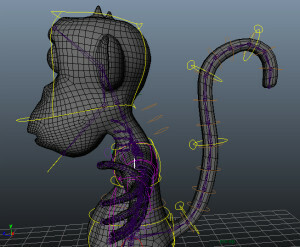 Hopefully one day, I will be working for a company that helps bring that calibre of film to life and I will be involved in the rigging, and then I won’t just know how it worked, I will have been involved in building it! 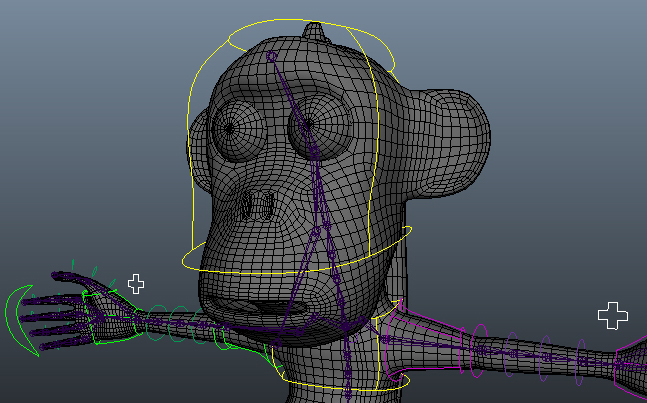 Whilst I was skinning I discovered yet another mistake with my leg (and arm) rigging. When constraining the three tibia joints so that they would always stay the right distance from knee and ankle, I used a parent constraint. I had thought this would mean they would twist nicely when the foot was rotated. What I had not thought about was that this would of course affect their rotation in all three axes, and not just the one twist axis I wanted. 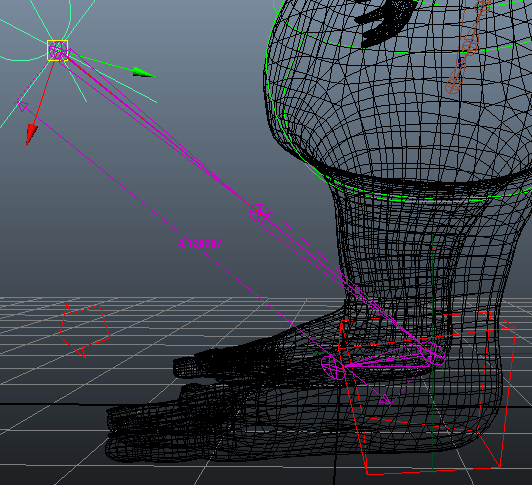 When I started working on the leg and looking at the movement during deform tests, I realised my mistake. 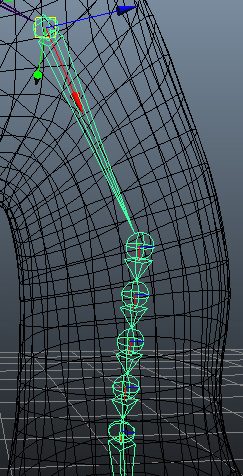 The joints were rotating and so rotating the leg mesh on an axis that the leg shouldn’t be able to rotate. 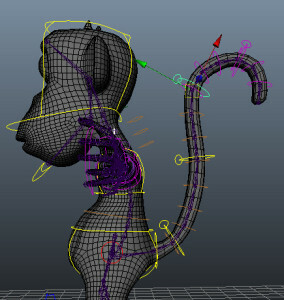 I had to delete all the tibia and femur constraints (including the parenting to the deform skeletons) on the IK chains. 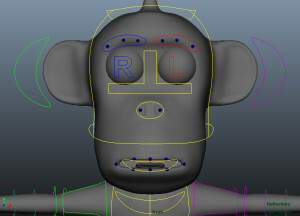 I also had to delete all the skinning I had done so far, as the deform joints were also out of position. I used the FK joints to reorient them correctly and then used a point constraint rather than a parent constraint to control their positions relative to the knee and ankle. I then wired up the ankle and wrist controller’s on the twist axis to drive the limb’s rotation. I simply wired up each of the tiba/femur joints to have 0.25 of the twist rotation of the ankle/wrist. Combined with the cumulative rotation of the parent chain, this caused the three joints to rotate 0.25, 0.5 and 0.75 of the ankle/wrist rotation. 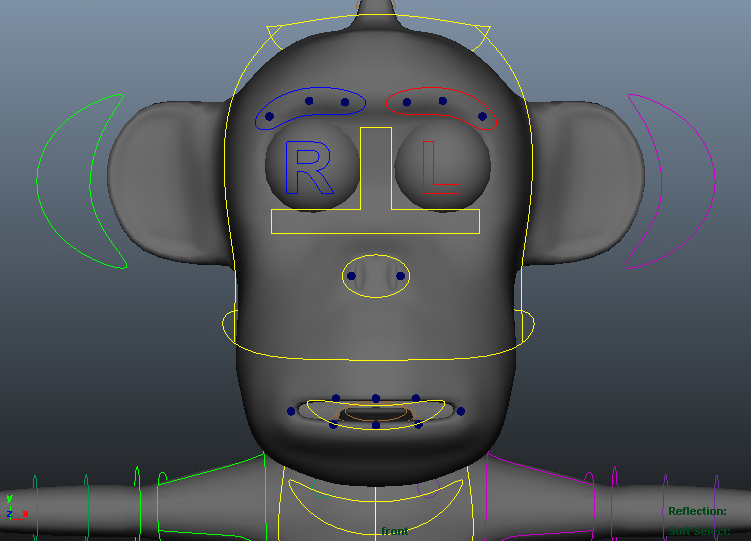 Then I just had to parent constrain the deform skeleton once more, wire up the various switches and I could start skinning again. Suffice to say, lesson learnt. I will be thinking much more carefully about which constraints I use in the future. 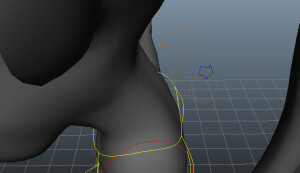 When first starting the skinning, I like each vertex to either be 100% influenced by a joint, or not influenced at all. I can define areas like the pelvis and the rib cage very clearly, and then seperate up the vertices in between and give influence to the joints in the spine. 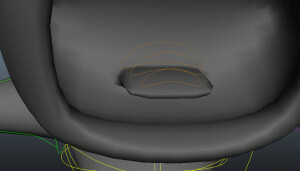 This results in deformations that have very sharp edges. However, it provides a very quick way to establish which areas of the body should be moving with which joints. 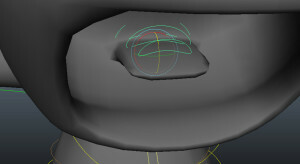 It also removes any unwanted stray influences from joints that are nowhere near an individual vertex. 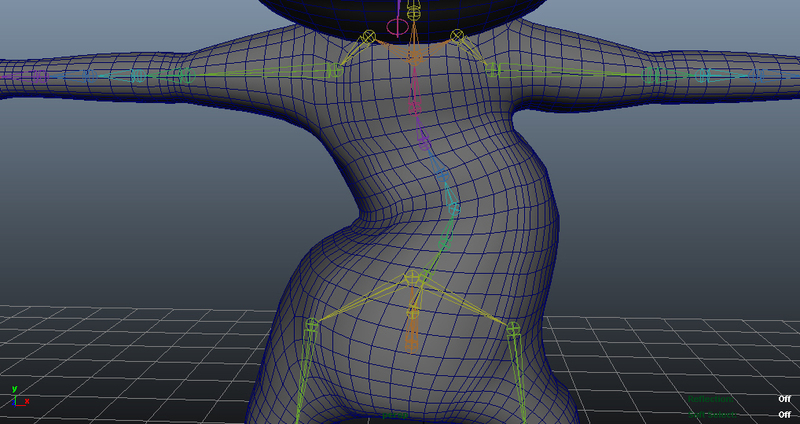 Once that is complete, I can start to smooth the influence so that multiple joints can be effecting any one vertex. The smooth tool is particularly effective for this part of the process, though it does occassionally cause an unwanted joint to gain some influence over an area of the mesh that you don’t want it to. 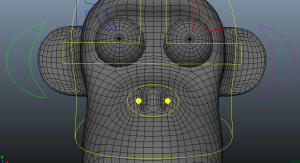 However, by swapping between joints and smoothing gradually the deformations become much cleaner. Having finally created working strethcy IK legs, I could get to work on making a set of FK legs. Like the IK, I duplicated the deform skeleton, but replaced the _jnt with FK_jnt. Unlike creating the IK leg, I didn’t need to create anything except controllers. 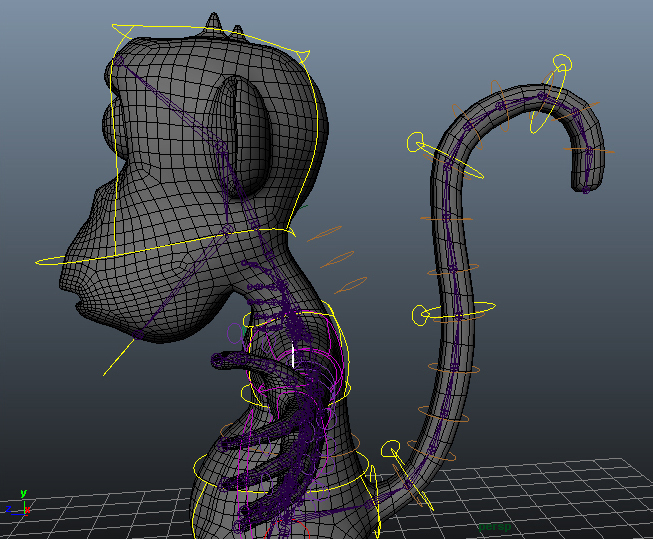 I used the curve tool with snap to vertex turned on and drew the shapes around the mesh of the monkey. 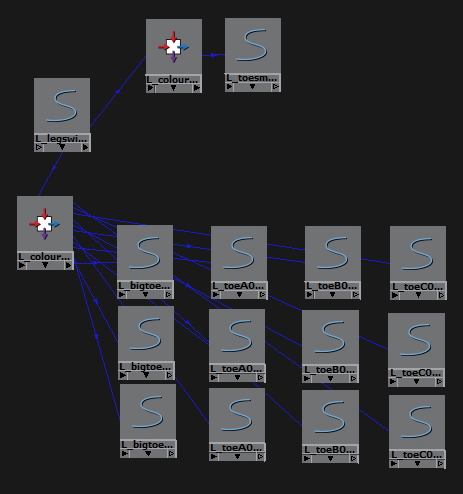 I used the MEL script “parent -r -s” to attach all the curve shapes to a single curve node so that the animator can click on any of the curves to select the entire controller. The thigh and ankle controllers I drew with curves, but I just used circles (which I editted slightly) for the knee and tibia joints. To try and keep the rig clear to use I colour coded my controllers. The most important controllers I changed to a brighter colour and the less important ones (like the tibia joints) were darker. 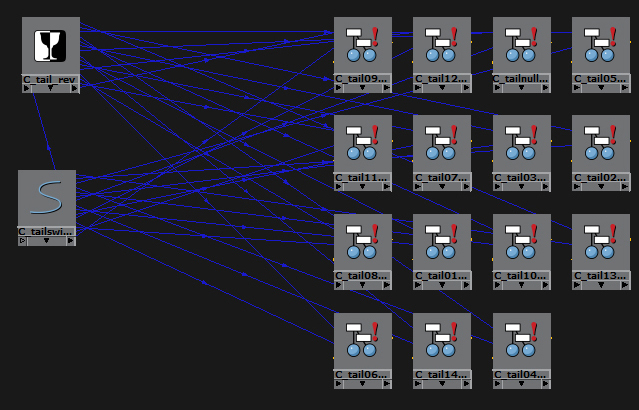 Like before, I nested all of these controllers in a double set of groups (_SDK and _0). 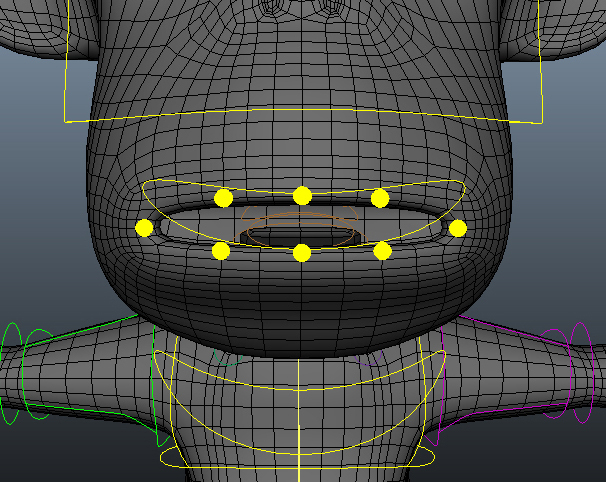 I then parent constrained each FK joint to its relative controller. 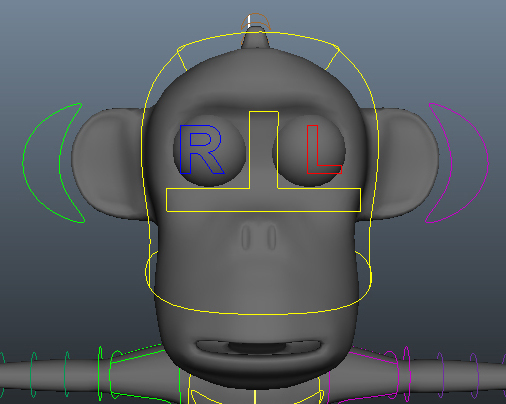 As the toe controls were parented directly to the deform skeleton (there was no seperate FK and IK version) I needed to get the main toe controller to follow both the IK and the FK skeletons. I created an FK/IK switch control for the leg and then proceeded to parent constrain the main toe controller to both the end of the IK and FK controller heirarchies. 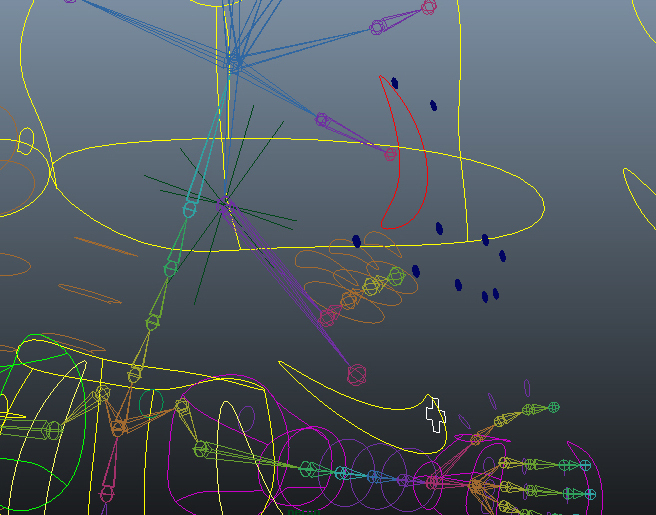 At the same time, I also parent constrained the deform joints to both the IK and FK joint chains. 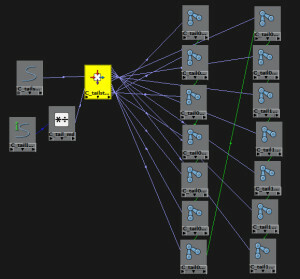 I then had to wire up the switch to control the parent constraints between FK and IK. I used the hypershade to do this. 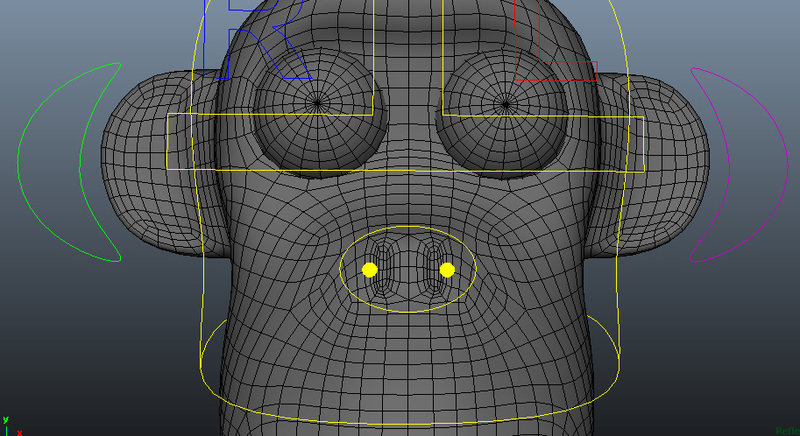 I brought the switch and the parent constraints in and also created a reverse node. I then also wired up the visibility of the IK and FK controllers so that the animator can only see FK controls when the switch is at FK, and IK controls when it is at IK. I decided to colour code the IK and FK so that it is clear at a glance whether the leg is set to FK or IK. For the IK I chose red (left) and blue (right), and for FK I chose pink (left) and green (right). However, since the toes are the same controllers whether the leg is in IK or FK, the controllers were just a single colour. 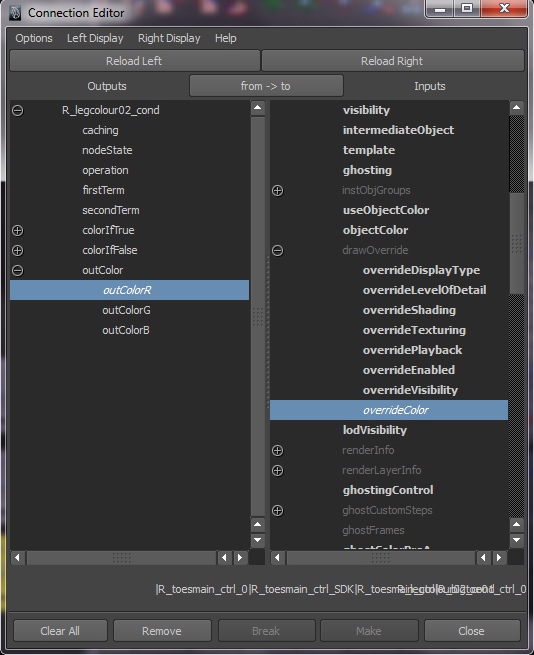 I spent a bit of time trying to work out how to use the switch to drive the colour override for the control shapes. Eventually I found that I could use a condition node that was true when the switch was above 0.5 and false when below 0.5. Then I wired the condition node to the drawing override of the controller. As the drawing override is not in the short list of things in the hypershade I had to open the connection editor and wire them up in there. Finally, I had to work out what number represented each colour. With some trial and error I eventually found the values and wired up all of the toe controllers so that they change colour. Success! 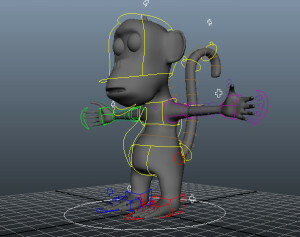 Im not sure I can truely put into words how frustrating creating the IK leg for this rig was. 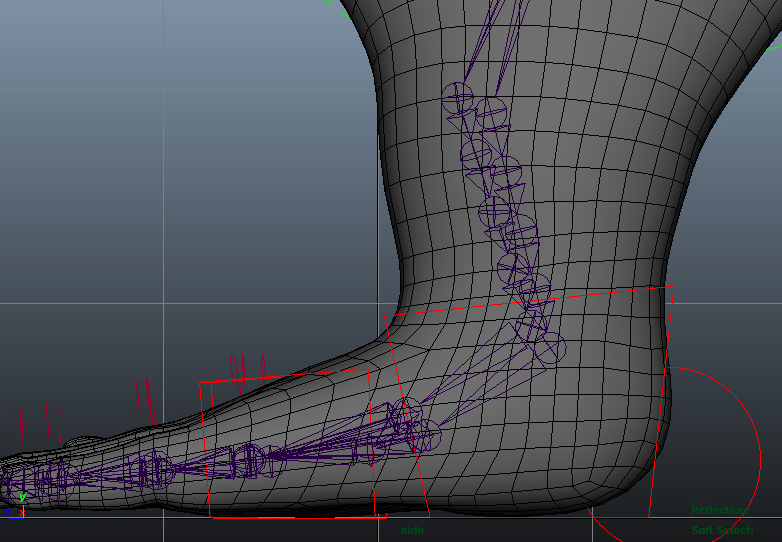 I do know, however, that creating a stretchy IK leg should not take almost 48 hours to get working. Before I duplicated my bones, I decided I wanted to put some extra bones along the lower leg to enable smoother twisting. To ensure things worked nicely later on I wanted to ensure that the three new bones I inserted were exactly a quarter, half and three-quarters of the way along the calf. To do this, I parent constrained each of the three bones to both the knee and the ankle, and made sure maintain offset was unticked. This placed all three bones exactly half way between the knee and ankle. 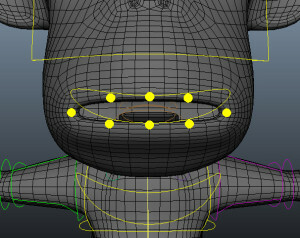 I then changed the weighting of the parenting to two of them. Femur01 was weighted 0.75 to the knee and 0.25 to the ankle, whilst Femur03 was weighted 0.25 to the knee and 0.75 to the ankle. I then deleted the constraints and used comet tools to orient the joints correctly. Once this was complete I created two duplicates (one for IK, one for FK). I then created a third duplicate in which I deleted the three femur joints and reparented the ankle straight to the knee. This was so that I had just two bones in the IK system. I called it the IKGuide. 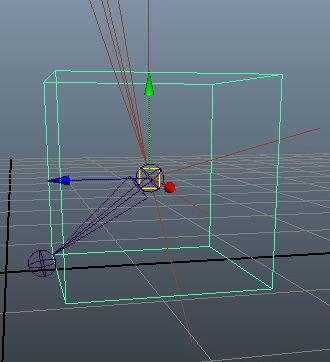 I created an IK on the joints and made a simple cube controller for the foot. I parented the IK handle to this control. 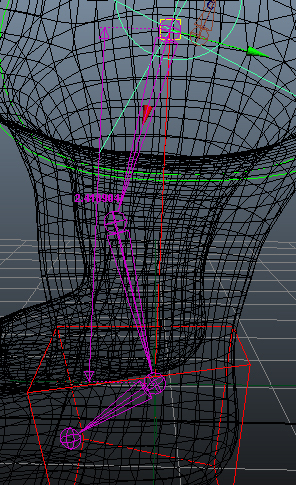 I then orient constrained the ankle bone to this controller so that it would not rotate as the leg moved. 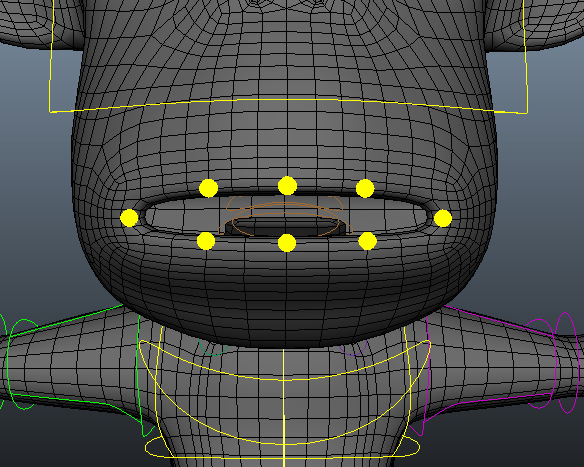 Finally, I created a simple circle controller and parent constrained the hip bone at the top of the IK to the circle. With the IK built and working, I started to set up the IK stretch. 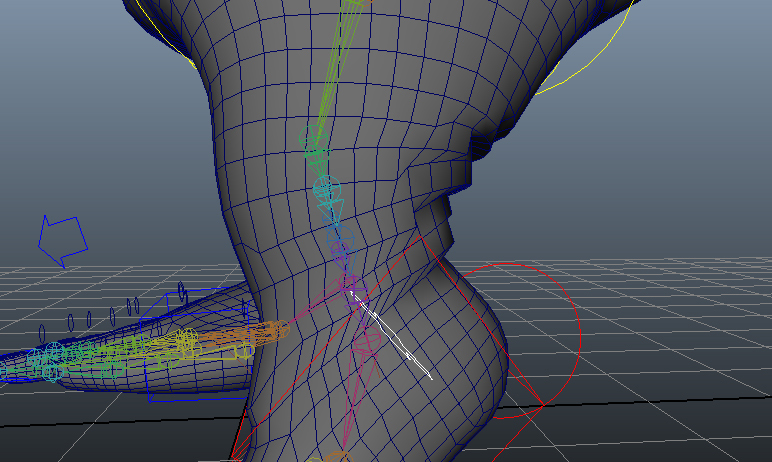 Like the IK spine, I needed to know how long the leg was at any one point in time. However, I only needed the straight line distance from hip to ankle. I used the distance tool for this. I aligned one locator with the hip and one with the ankle and then parented them to the corresponding controllers. 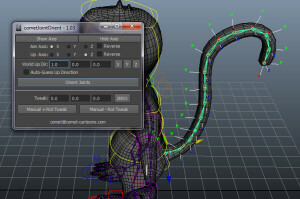 Now, as the leg moved, the distance tool would always give the distance from hip to ankle. 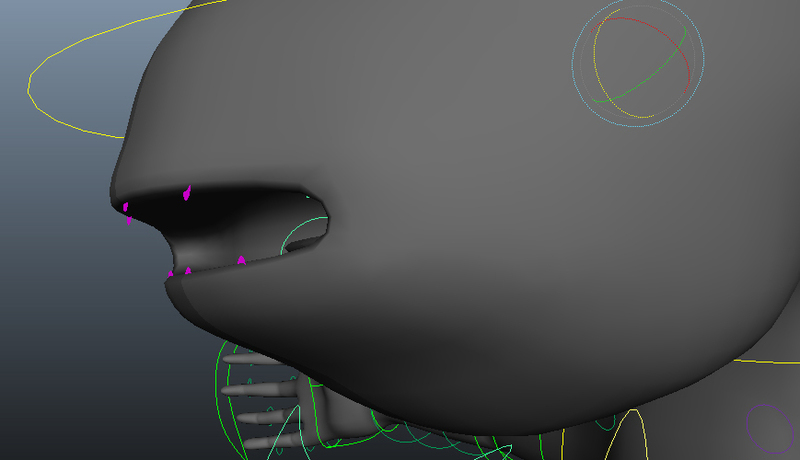 At this point I also realised I had not created a knee controller. For this I used an arrow shape. 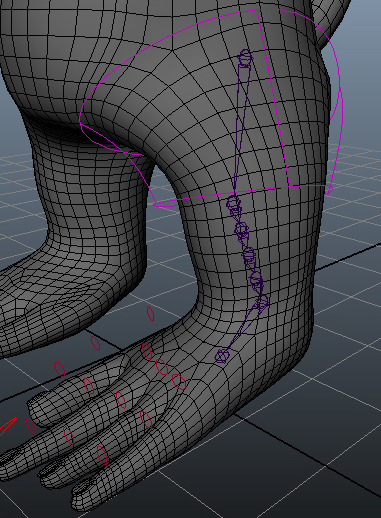 I point constrained the arrow to both the hip and ankle (with maintain offset unticked). This placed the arrow on the plane between the two, directly in the centre. I then used an aim constraint to ensure the arrow was pointing directly at the knee. 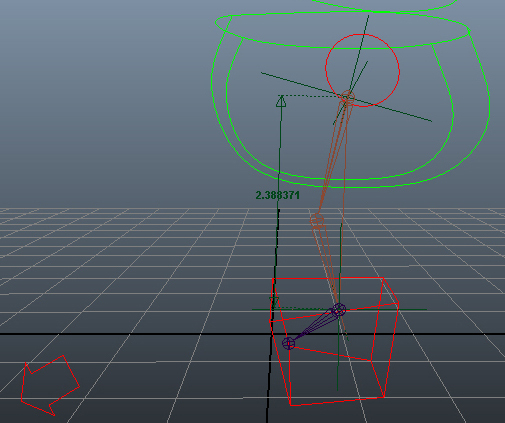 After deleting both constraints I moved the arrow in front of the knee and set up a pole vector constraint on the IK. To wire up the stretchy leg I used another multiply divide node and, like the spine, the distance was wired to the first input. The second input needed to be the length of the thigh bone plus the length of the calf bone. As the joints had been oriented correctly this could be found simply by adding the x transform of the knee and ankle together. I changed the node to divide and wired the output to the “true” output of a condition node. The “false” output was left as 1. 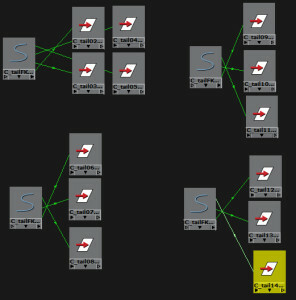 The condition node also had the distance in the first input and the length of the two bones as the second. It then compared the two lengths, and if the distance was greater than the bone length, the condition was true. I then wired this condition node to the x scale (length) of the thigh and calf. The two bones of the IK scaled nicely. Unfortunately, the ankle and foot bones were being scaled strangely when the leg stretched, despite not being wired to the condition node. I even checked the scale of both and x, y and z were all still showing as 1. 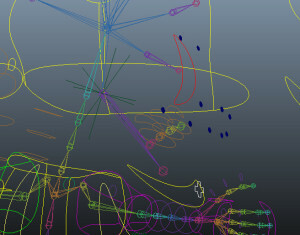 This meant the bones shouldnt have been scaling at all. 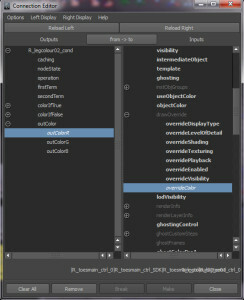 I tried deleting the IK and remaking it, but the problem persisted. 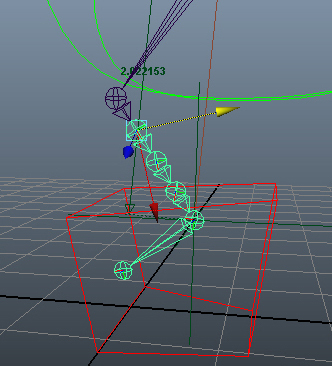 I then tried moving the controls with no IK present at all, and the ankle and foot continued stretching strangely. I could only assume there was something strange with the bones, so I deleted the IKGuide joints and re-created them. I set everything back up, re-wired the thigh and calf x-scale to the condition node and tested it again. I had exactly the same problem all over again. I tried re-creating the bones once more that evening but with no success. I finally decided the only option was to go to bed and look at it with a fresh mind in the morning. As is often the way with re-visiting a problem the next day, I tracked the issue down quite quickly. I had all the joints in the hypershade to make sure my ankle and foot definitely hadnt managed to end up wired to anything and I realised there was no line showing the parenting of ankle to knee. I un-parented the ankle bone and re-parented it to the knee and the problem disappeared. I was delighted, until I found yet another problem. Whilst the ankle was no longer scaling strangely, it still was not doing what I expected when I moved the hip too far away. Despite being orient constrained the foot controller (and as such theoretically unable to rotate by itself) when I moved the hip controller forwards or backwards so that the leg stretched, my ankle would rotate. 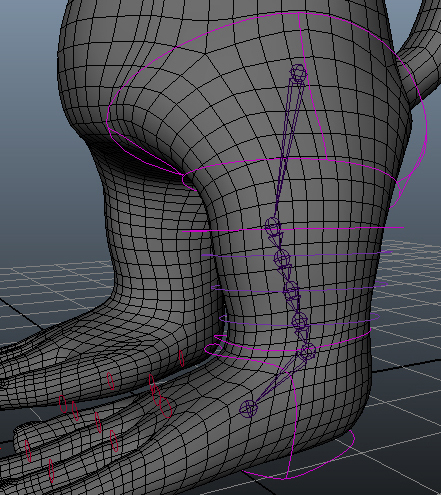 I decided to fix the problem by simply creating a new version of the ankle and foot bone. 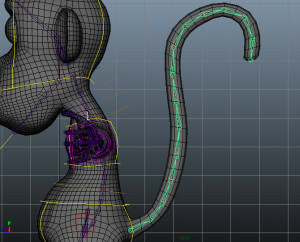 I simply point constrained the new ankle joint to the one on the IK leg and orient constrained it to the controller again. Success! Problem solved, just not as tidily as I would have liked. It also left me feeling frustrated because I wanted to know why the problem had occured so I could avoid it in the future. 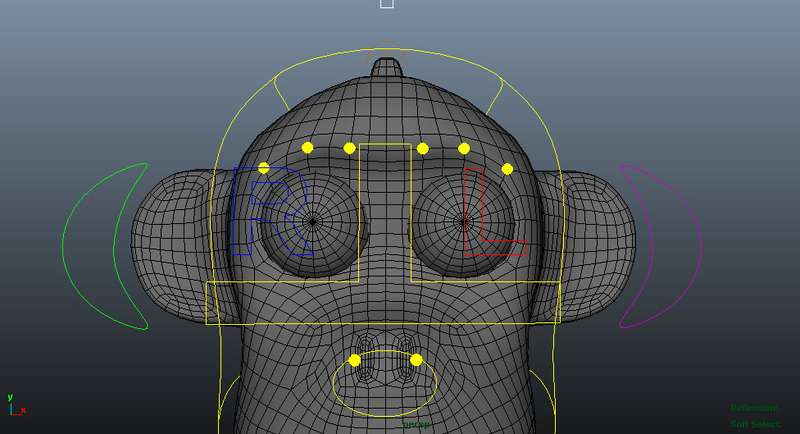 Still, at least the problem was gone and I could get on with parent constraining the IK joints to the IKGuide joints. 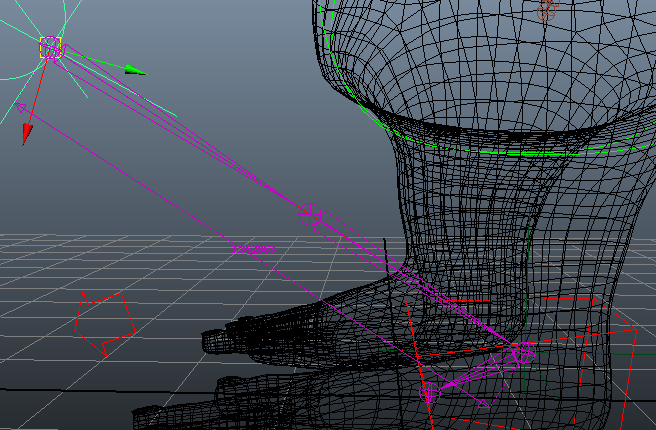 I unticked maintain offset and parent constrained all the joints to their respective guide joints. I parented the three femur joints in the same way I created them; by parenting to both knee and ankle and then editting the weights. However, what I hadn’t thought of was that a parent constraint would cause the joints to rotate out of alignment due to the ankle’s orientation. I pondered the problem for a while and decided I would simply ensure to maintain offsets when constraining the deform joints to the IK joints. 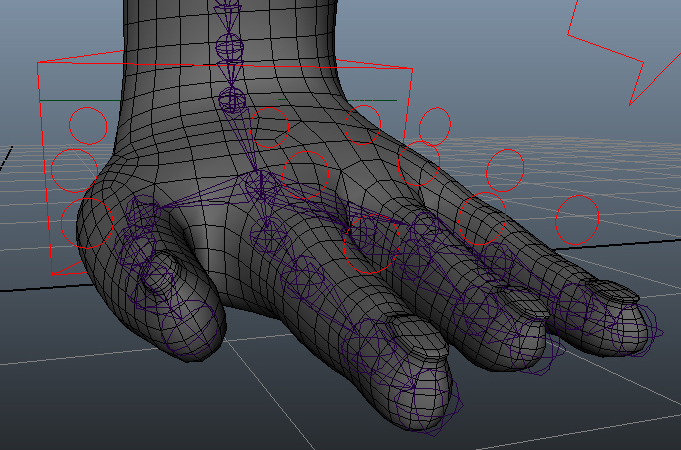 I then set to work creating a control system for the toes so that I could create a simple set of foot roll controllers. 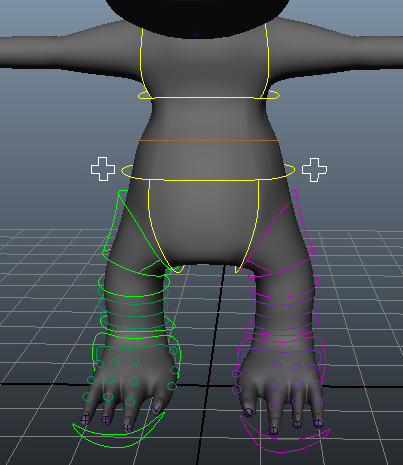 Initially I decided to place a circle controller around each joint of the toes, but it quickly became clear that some of them would be hard to select. 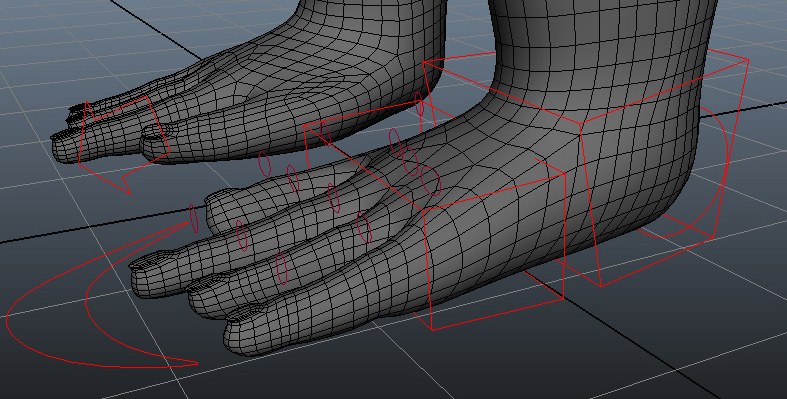 Instead, I moved the curve shapes of the controllers above each toe joint and this made them much clearer and easier to see. 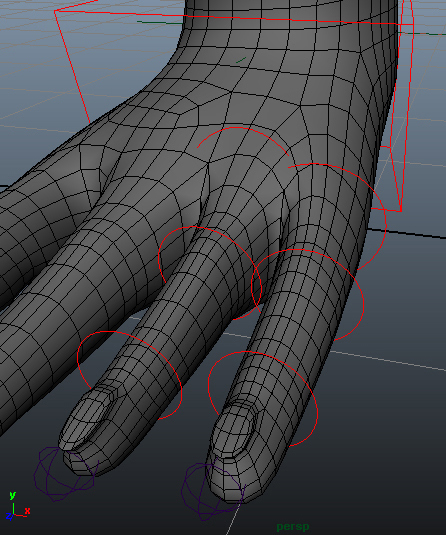 Finally, I also made a main controller that would be used to curl all the joints of a toe. I then began creating a simple set of foot roll controls and with some re-parenting of the IK handle my IK leg was complete. 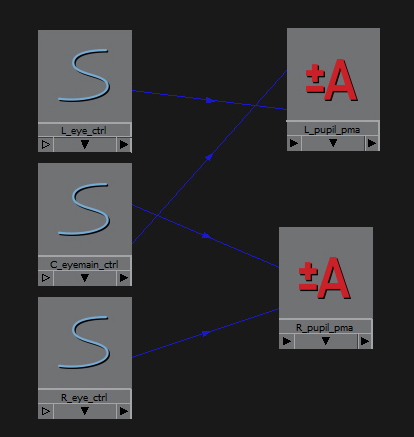 Unfortunately, I quickly checked things in my orthographic side view and realised that at some point during the creation process I had managed to cause the entire IK system to move out of alignment from its starting position, despite all the controls being at 0, 0, 0. The only option was to yet again build the entire IK leg. 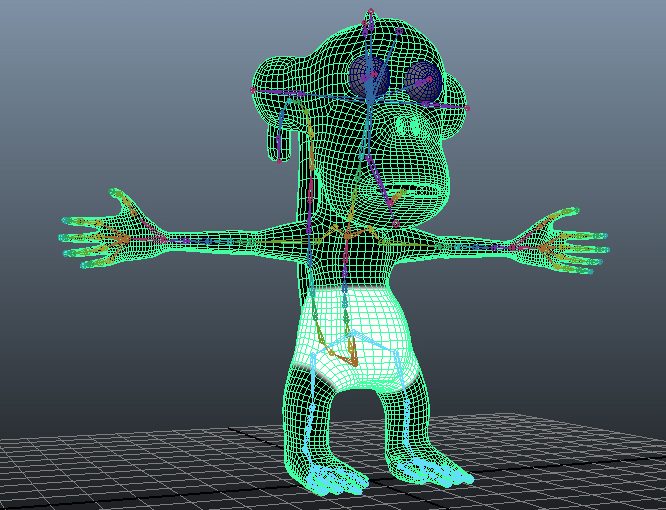 I deleted all my bones, mirrored the right hand leg to the left hand side. 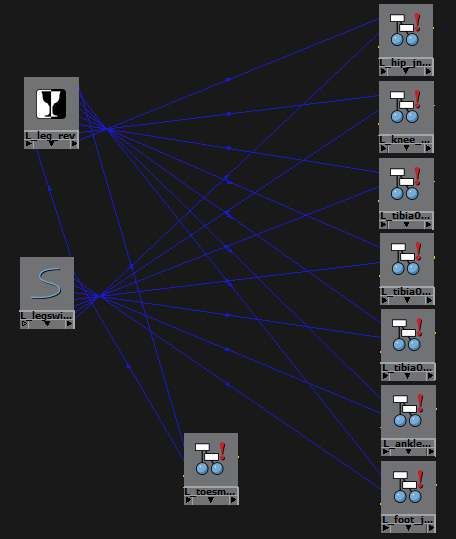 The good thing was, that at least this time all the controllers were already built so all I needed to do was wire everything up correctly, and make sure my controllers were correctly aligned before constraining/parenting things to them. Fortunately, this time I got it right and my left IK leg was finally complete. Hooray!